Most gaming accessories, keyboards included, are grossly overpriced. Manufacturers think that simply slapping LED lights on an otherwise ordinary product warrants a significant price increase. Fortunately, there are some gems to be found even in the budget category. Here are our top 5 favorite gaming keyboards under $50 that you can buy today. 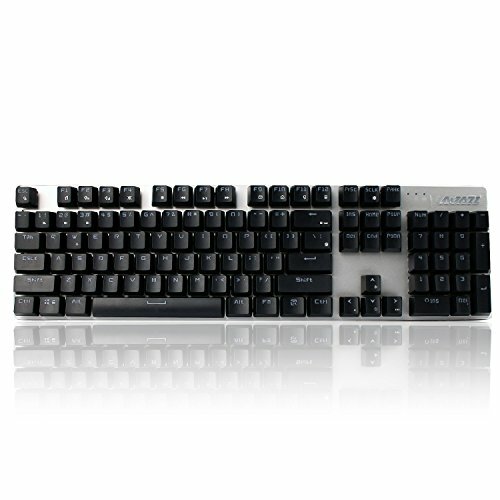 Are you looking for a keyboard that would not only make gaming more enjoyable but also allow you to do you day job better? The K55 from Corsair is what you’re looking for. 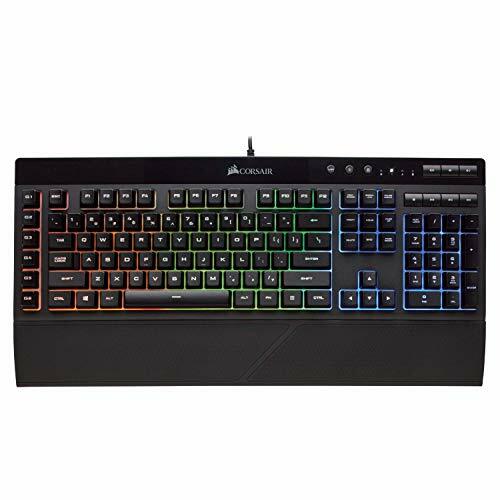 This full-sized keyboard features dedicated volume and multimedia controls, 6 programmable macro keys, detachable soft rubber wrist rest, and three-zone dynamic RGB backlighting. The macro keys let you assign complex actions to a single key, which is just as handy in MOBA games or MMORPGs as in Excel or Word. The keys on this keyboard are precise yet quiet. While many regular and mechanical keyboards are unusable in the office or school environment, this one won’t bother your coworkers or roommates at all. Best For: Gamers who need to get things done. 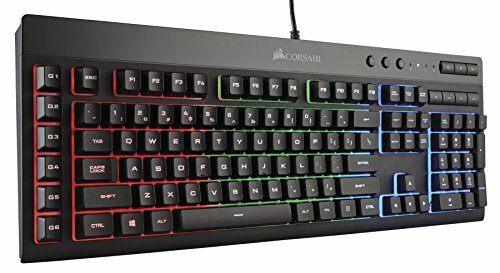 An ergonomic keyboard and mouse combo with RGB backlighting for less than $50? You bet! The Rii RM400 stands on with its ultra-low profile keys with minimal travel distance and laser-etched keycaps. Repetitive stress injuries (RSIs) are no joke. They may not be as stirring as a black eye from a Hollywood-like fist fight, but they sure can make a person miserable. Gamers often suffer from RSIs because they spend long hours smashing the same keys over and over again. 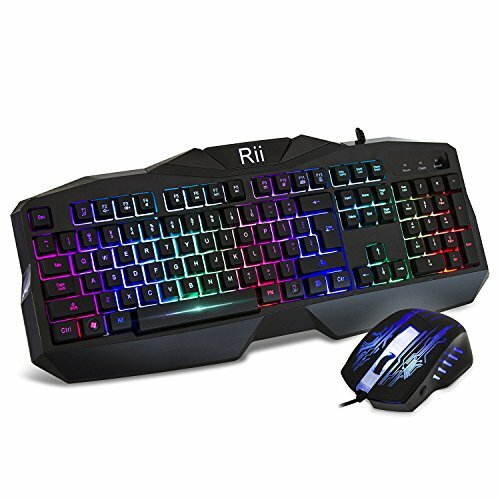 This affordable keyboard and mouse combo is a great way how to avoid RSIs and rank higher on leaderboards. Included on the keyboard are dedicated multimedia keys for controlling music, and volume. The mouse has three different DPI settings you can choose from on the fly. Best For: Everyone who doesn’t want to risk developing an RSI. Designed to take your gaming to the next level, the Plixio gaming keyboard comes with truly high-end features, such as programmable color modes and a tangle-free cord. The LED backlighting can be changed to purple, blue, or red, and the keyboard automatically dims the LEDs when not in use. It connects to your PC or Mac via a braided USB cable that’s built to last a long time of heavy use. 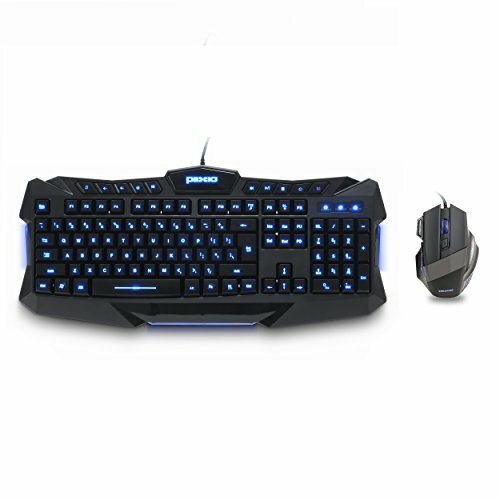 Included with the keyboard is a 6-button gaming mouse with 3 mouse skates for precise control. You can chance its DPI settings from 800 DPI all the way up to 2,400 DPI. For around $35, there’s not really anything we can criticize about this bundle. Best For: Budget-minded gamers who are looking for an excellent deal. Not all full-sized mechanical keyboards are expensive. The Ajazz Firstblood AK52 features the Blue Zorro switches, which are virtually identical with the Cherry MX Blue switches. 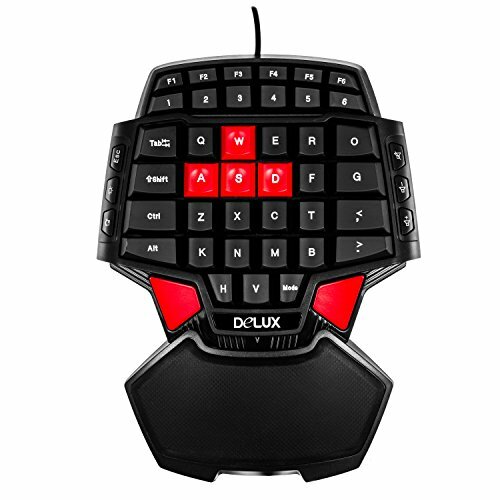 In other words, they are tactile, clicky, and suitable for both gaming and typing. The base of the keyboard is made out of aluminum and ABS plastic, making the keyboard stable and extremely durable. 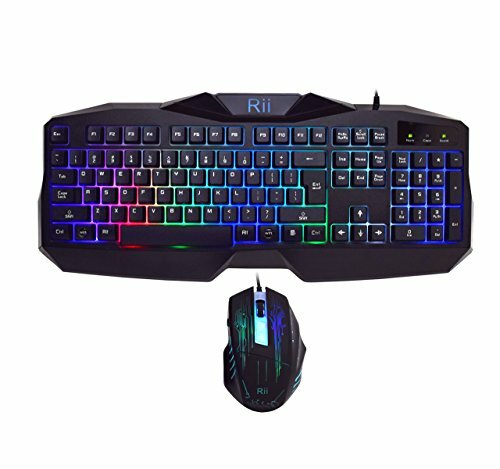 Other useful gaming features include N-key rollover, which allows the keyboard to register multiple key presses without any delay and 8 backlighting modes, which include an FPS mode and MOBA mode. Best For: Avid gamers who are not satisfied with the limited performance of rubber dome keyboards. Let’s face it: you don’t actually need a full-sized keyboard when gaming. Something smaller that has only the essential keys would do just fine while at the same time providing you with more space for a mouse. This 46-key singlehanded backlit gaming keyboard from DEEBOL is perfect for the fans of the FPS genre and anyone else who’s not afraid of custom keybinding. Despite its unusual size and shape, this LED-backlit keyboard is compatible with all modern operating systems, including Windows 10, Linux, and Mac OS X. Even the dedicated multimedia buttons should work without any problems. Best For: Those who want more mousing real estate.